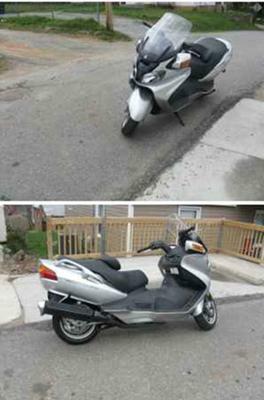 The 2003 Suzuki BURGMAN 650 Scooter for Sale has both automatic and manual shift modes using a push button to make your selection. The excellent used Suzuki scooter for sale is an in excellent condition with approximately 4800 miles on it currently. The motor scooter has never been wrecked and is in excellent condition. My only reason for selling is that I have no desire to ride it any more. The scooter for sale is located in Lynchburg Virginia and my asking price is a very cheap $3900. To receive a quick response to any questions or requests you can reach me by e-mail using the comments form found directly below this classified(and don't forget to mention that you found this ad on Strike Lightning's used motorcycles for sale gogocycles.com). You won't find a nicer used Suzuki Burgman scooter for sale in Virginia, on any other classified ad sites, on Craigslist or in an Ebay auction so hurry and make an offer before it gets away from you! Strike Lightning would also encourage bikers to submit a review of the 2003 Suzuki BURGMAN 650 Scooter for Sale to make the biker community aware of any problems that are commonly associated with the 2003 model Suzuki Burgman scooter or to highlight its positive features and help potential buyers make informed decisions. where are you located and are you willing to take so much down and weekly payments.